Rubber stamp a Brontosaurus and color him ferocious or friendly! 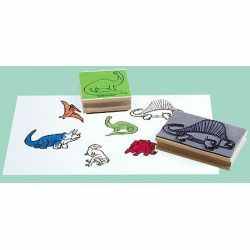 Unique set contains six giant dinosaur stamps for a variety of prehistoric art projects. Stamps range in size up to 2 3/4" x 4".